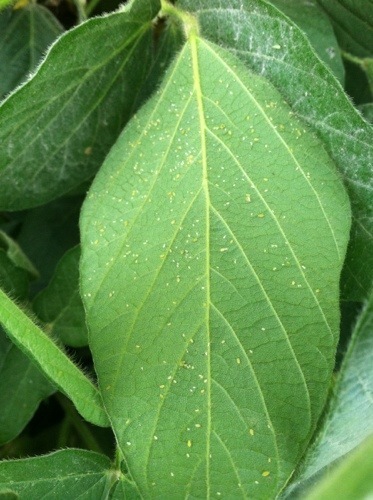 Today I’m looking at our soybean fields that were sprayed last week with an insecticide to get rid of the millions of aphids sucking the life out of our soybean plants. Before we made the decision to spray, I went into every field to determine if spraying was necessary. Chemical use is not my cup of tea, but I could see the dollar signs melting away as the aphids kept sucking the plants juices away. 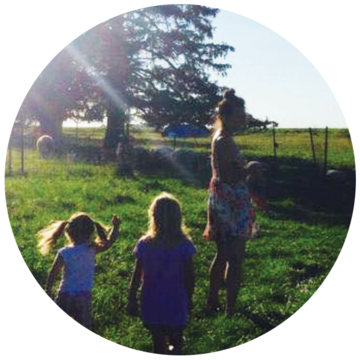 As a farmer, I am here to protect my plants, soils and livestock to the best of my ability. 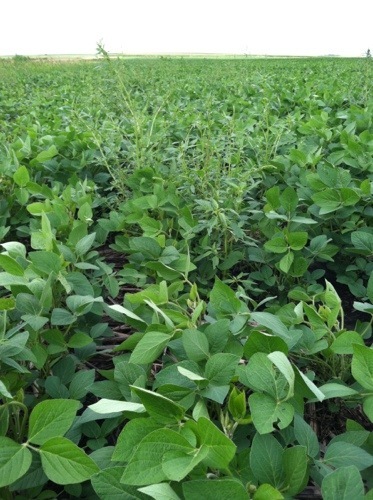 To give up and say that the soybean crop will amount to nothing, with or without aphids, goes against all that I believe in. After thoughtful discussion with my dad, we decided to spray. It’s costly, and it kills all bugs, even beneficial ones, but in the long run it saves our plants and our consciences. When scouting before we sprayed, I walked out of each field covered in aphids. 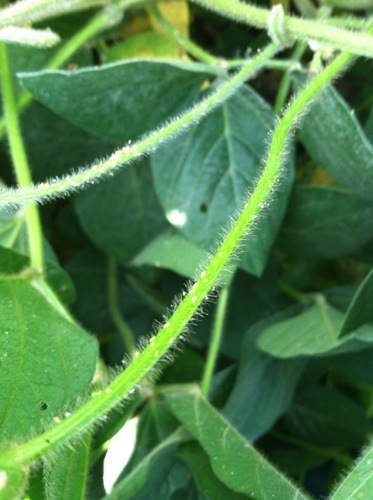 My pants were sticky with the sweet soybean juices that filled the aphids’ bellies. At that time, things were in the verge of exploding into a major aphid over population. Today, I’m walking through the fields and I see dead skeletons of aphid bodies everywhere. Some are still barely moving, but it’s as if a nuclear bomb went off and wiped them out. I feel bad for the beneficial insects, but there were way too many aphids for them to eat. I think we made the right decision for our company. We saved what soybean yield we do have and am giving the plants am opportunity to spit out a few more pods before they shut down. 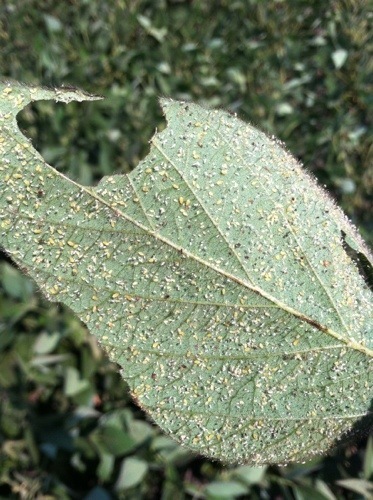 Here’s a picture of an aphid infested plant. 250 aphids per plant is the threshold. I think we were looking at close to a thousand per plant. The photo above is after spraying. The aphids are still on the plant but are stunned and will soon die. When I was 18 years old, I couldn’t wait to get off the farm. Since I learned how to walk, my dad made me walk beans every summer. I never got paid, it was just another farm chore we had to do. Never in a million years did I think I would be walking beans 20 years later. For one, I never thought I’d come back to farm when I was 18. And two, I thought the latest technology would zap all the weeds by a laser or some sort of apparatus. So here I am again, in the same field that I walked every summer for 18 years (give or take a few for crawling), walking beans again. The weeds are smart. They live to survive and reproduce, much like all of us and all species on earth. They have adapted to the nasty herbicide that’s been applied since around 1993. My dad didn’t have anymore free labor, so he had to start spraying herbicide the year after I left for college. Sometimes life is funny. It always comes around full circle. Maybe I need to invent that laser weed zapper…hmmm.